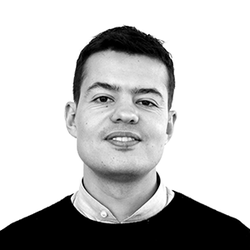 ﻿Iannis Kandyliaris is a Senior Designer at BIG, where he has led the design of a number of projects, including the Phoenix Observation Tower, the Telus Sky Tower and the Pier 6 Viewing Platform at the Brooklyn Bridge Park. In 2015 he led the design of the exhibit and the accompanying book, “Hot to Cold: An Odyssey of Architectural Adaptation,” which displayed the past five years of BIG’s work at the National Building Museum in Washington DC. ​Prior to joining BIG, Iannis was an Associate Principal at Brooklyn-based SO-IL, contributing and leading numerous award winning and widely published projects, including the Pole Dance installation at the MoMA PS1, the Kukje Art Gallery in Seoul, and the Frieze Art Fair venue in New York. Iannis has also worked as a researcher in design innovation at the Harvard Graduate School of Design where he graduated in 2008.